We manage to delve into a few of them, including Dr. Roylott's clever yet poorly executed plan, the seemingly disparate time it took for victims to die, a passing glance at scores of untold cases accumulated during those early years, and more. Narrator: [00:00:11] Yes the Band was Speckled and there were Six Napoleons, but there are so many other details to pick apart in the stories. Jeremy Brett: [00:00:18] Pray, be precise as to details. Narrator: [00:00:21] You know the plots, but what about the minutiae? Have you ever stopped to wonder about why Dr Watson was called James by his wife? Or of Sherlock Holmes's dining habits? Or what happened when he let a criminal escape? Jeremy Brett: [00:00:35] This is my business to know what other people don't know. Narrator: [00:00:47] Episode 14. The Speckled Band and its Snakish temper. Scott Monty: [00:00:56] Hello and welcome back to Trifles, the Sherlock Holmes podcast where we get into the details of the Sherlock Holmes stories. I'm Scott Monty. Burt Wolder: [00:01:06] And I'm Burt Wolder. Scott Monty: [00:01:07] How about that? Are you - are you ready for yet another week, another month ahead of us? We are at the top of April now. Burt Wolder: [00:01:16] How did it get here? Scott Monty: [00:01:18] Spring is springing up you know - just keep turning the pages of the calendar and we will move along with you. With any luck. Well, we are in for a treat! And before we get started, how about a reminder here? Folks, if you would like to help us out you can do a couple of things: 1) Go to the platform of your choice - whether it's Google Play or iTunes, and leave us a rating. Let people know what you think of the show. That helps us continue to get in front of more people and helps other people enjoy the show. So please leave us a rating and or a review. Scott Monty: [00:01:57] And of course this is a Patreon-supported show. We already have a handful of people who have pledged a certain amount per episode. We appreciate that. But we could always use more. You know, the transcript costs, the e-mail costs, the file-hosting costs - it all adds up. So if you can do your part and just click on the Patreon button on our site SherlockHolmesPodcast.com, that would help us out. And thank you as always for your comments. We've seen them coming in on the Web site. And we do appreciate your feedback. We've been interacting with you there, so keep the comments coming. Scott Monty: [00:02:36] Now let's get on with the show. We promised you at the top of the show The Speckled Band and it's snakish temper. And look, this is the first time we're getting to talk about the Speckled Band. This is a story that is so rich in details. It is so full of characters or one character in particular. As you know we have a mention of Mrs. Hudson, we have Holmes's deductions that come from splatters of mud on Miss Stoner's dress. We have an evil villain, we have a mysterious manor house so many elements to talk about and we will get to those and more over the course of this podcast. However, for this episode I want to talk about the Speckled Band and its snakish temper. So here we have Sherlock Holmes really at his best. He's kind and considerate to Miss Stoner as she's shivering and shaking in his sitting room and he's cool and poised in the presence of the villain Dr. Grimsby Roylott of Stoke Moran. And what danger he faces. He tells us of as he and Watson are you know holding their Stakeout. He tells us exactly what they're up against. Jeremy Brett: [00:04:09] "A ventilator made, a cord hung, and a woman who lies in the bed, dies." [00:04:13] Now if that doesn't set you up for suspense. I don't know what does. But - we know. We've talked to people, we've read articles over time, we've asked people "when's the first time you came across Sherlock Holmes?" and they say, "Oh, I read that story with the snake." You know, even if you can't remember the title of it, you remember the snake. So this is consistently one of the top rated stories in the entire canon. And it was first published in The Strand magazine in February 1892 and probably one of the most unique instances all of the chronologists agree that the case actually took place in early April 1883. Scott Monty: [00:05:13] Well he's he's messed with us before you know. You know we've just mentioned in the last episode "The Adventure of Wisteria Lodge," and Watson says it opens in March of 1892. Can you, can you hear anything wrong with that date? Burt Wolder: [00:05:35] Well perhaps yes. Scott Monty: [00:05:36] It's smack in the middle of the great hiatus after Holmes supposedly went over the Reichenbach fall with Professor Moriarty. Burt Wolder: [00:05:42] Hi, atus. Scott Monty: [00:05:45] "What do you say when you meet an atus?" Well, as we said, there is so much to unpack in The Speckled Band and we're not going to get to all of it. But we do want to focus on just a few things of note this time around. So first: wonderful opening, April 1883 and Watson says "In glancing over my notes of the 70 odd cases in which I have during the last eight years studied the method of my friend Sherlock Holmes." Now the Speckled Band is the is only the eighth story in this series of The Adventures of Sherlock Holmes. And within that span of eight years, we're already hearing of 70 unreported cases. And I would imagine it would take a an act of the chronology gods to go back and figure out exactly which of the unreported cases happened during this time. Isn't it remarkable that Conan Doyle this early on in the series is already kind of planting a seed in our minds that this is a character or a set of characters that goes well beyond the printed page that we've had opportunity to see. Burt Wolder: [00:07:03] Well that was the defining characteristic of the reality of Sherlock Holmes - that he's created the voice of Watson who is presenting all of this as real events and real solutions to real cases. And you know with a stroke he has created a universe of possibilities for himself, which is a very clever thing to do as a writer. Scott Monty: [00:07:28] Well and how much do you think that that setting - of referencing previous cases - placed Sherlock Holmes squarely in the "reality confusion market," versus other things like placing him on Baker Street or just having him seem like a contemporary. What do you think the impact was of of story elements like that? Burt Wolder: [00:07:55] What do you mean when you say reality confusion. [00:08:02] People are going to really think that Sherlock Holmes is real. I mean they're still confused today...but at that time. Burt Wolder: [00:08:10] As we know he is. I think I think Conan Doyle didn't pay any attention to it. And I think he was baffled by how successful his... You know he you know he's read so widely as a child. I mean we've learned this through other conversations with other people and their observations about Conan Doyle. But he had read Poe, been influenced by so many writers, by so many great adventures of the Knights of the round table. He knew how to tell a tale. And I don't think he gave it much thought and I think he was surprised in later years how successful it had become. And it was a continuing point of irritation to him. You know, at one point after he'd been knighted he was knighted - for his work really - in explaining to the public the rationale from the British point the perspective behind the Boer War. He famously received a letter or an invoice tradesmen at home and the bill or note was made out to serve Sherlock Holmes and he was absolutely furious. And sent a curt note down to the tradesman and the tradesmen came running up to the house, very embarrassed, and said, "You know, my friends told me that you'd been knighted and when you're knighted you adopted a new name." And of course he realized at once that they were, you know, playing a joke on the tradesman and he laughed it all off. But you know it's -- that's the constant experience with the Canon. Scott Monty: [00:09:42] Yeah. Yeah. Well, enough about reality. Let's get onto murder. Burt Wolder: [00:09:48] Well no. Now we should say just another couple of things about reality, because the beautiful part about Speckled Band and how it starts is Watson does this introduction and says basically he says to you you know he's precluded from telling you about these adventures but now the lady in question has died and there's have been some some curious mutterings about the death of Grimesby Roylott. I really feel the need to set the record straight. And so he then begins to tell you that he was woken up. You've got one of these wonderful sentences in the Canon - Watson looks at his clock on the mantel piece and realize this is only 7:15 in the morning and there's Holmes, fully dressed standing by his bedside and Holmes says, "I'm sorry to knock you up Watson, but it's the common lot this morning. Mrs. Hudson has been knocked up." [LAUGHTER] "She retorted upon me and I on you." And Watson says, "Well what is it, a fire?" And Holmes says, "No, no. It's a client - a young lady has arrived in a considerable state of excitement who insists upon seeing me." So BANG! You know you're right into this adventure. Scott Monty: [00:10:51] Yeah. And none of us could stifle a Beavis and Butthead moment on hearing that Mrs Hudson had been knocked up. She's getting very busy. Burt Wolder: [00:11:03] Well and then you know you're off to the adventure and you're in the sitting room. Mrs. Hudson's brought up a cup of coffee and the poor young lady is shivering, and Holmes says, "Draw up to the fire" and "Mrs. Hudson has had the good sense of providing a cup of coffee. I see you're shivering." And she says in one of these lines that's a lot like "Mr. Holmes, they were the footprints of a gigantic hound," - she says, "It's not cold which makes me shiver," said the woman in a low voice. "It is fear Mr. Holmes. It is terror." Scott Monty: [00:11:38] Yeah. Just classic, classic opening. And that's of course when we find out a little bit about her background. And we kind of glossed over it already, but isn't it interesting that this was written or published in 1892, and Watson mentions the eight years that passed between publication and when the events happened. And yet we find out that our heroine here has passed on - you know, "the untimely death of the lady to whom the pledge was given." How sad - Holmes was able to save her allow her to go on to her marriage. And by the way there are SPOILER ALERTS in this show, folks, in case you haven't figured that out. But the fact that Holmes was able to save her so she could go on and marry, and then died less than eight years later. What a tragic life. You know her mother had been killed in a railway accident, her sister had been killed, her stepfather had been killed. You know. How sad for these people. Scott Monty: [00:12:48] But speaking of stepfather And speaking of murder and killing I have to say if you are a doctor and choosing your method of trying to rid yourself of a family member it's pure genius to use a snake. Jeremy Brett: [00:13:05] When a doctor is wrong he's the first of criminials. He has nerve. He has knowledge. Scott Monty: [00:13:14] You know because when you think about it - certainly back in those days - even if the coroner had figured it out, had said, "Oh, I see these puncture marks and they match to what might be a snake." Well, Roylott could say, "Well of course, we have a snake that wanders the house," or "I have many Indian or exotic animals. It just it happened to bite my stepdaughter. It was an accident- an unfortunate accident." So he could have gotten out of it had he been caught. And I think that his ego got the best of him, because it worked so well that he wanted to repeat the process for daughter number two. And of course the Stoner sisters are twins. But why wouldn't he. Why did he do it so soon after the first daughter died? Wouldn't that have drawn more suspicion? And then why did he go and try to murder Helen right after she visited Sherlock Holmes, knowing that Holmes was on the case? Do you think he underestimated Holmes or was he just desperate? Burt Wolder: [00:14:23] Oh I think he's a monomaniac and you know clearly you've got that magnificent scene in the sitting room later on when he confronts Holmes. He's a grand bully, strong, used to getting his way. A powerful personality perhaps a bit of a narcissist. And you know, doesn't think about the possibility of failure - just thinks about going on and on and on. And yet we know from the real life experience of some murderers, that chillingly, having succeeded ones succeeding again is more natural to them now. Jeremy Kemp: [00:15:34] I have heard of you before. Holmes the meddler. Holmes the busybody/ Holmes the Scotland Yard jack-in-office. Scott Monty: [00:15:45] And and Holmes is so cool. He simply glances at the door and he said there's a decided draft. Please don't let the door hit you on the way out, basically. Scott Monty: [00:15:57] Well you know, it's just -- it's a wonderful old one. So many reasons that dramatization works so well. But also it's another indication that Conan Doyle understood the craft of writing, because the craft of writing - it's the same thing really when you look at scripts and television and movies: you want to show people things, not tell them things. And how do you show that Holmes is brave, confident, a force to be reckoned with? You know you confront him with a powerful evil and you show him reacting, and that calm cool reaction. It was just so beautifully done, and it's really part of the craft that Conan Doyle mastered so well. Scott Monty: [00:16:41] Yeah it really was. So. So here we have the two deaths that we're treated to: one Helen told us about her sister Julia's death and retrospect, and then of course we witness the death of Dr. Grimsby Roylott firsthand. And in the first instance Julia wandered out into the hallway and she screams - she wandered in the hallway. She had the chance to tell Helen "It was the band - the speckled band!" Helen ran to get her stepfather - their stepfather. He came out - put his gown on, came out - and held Julia. And then she died in his arms. 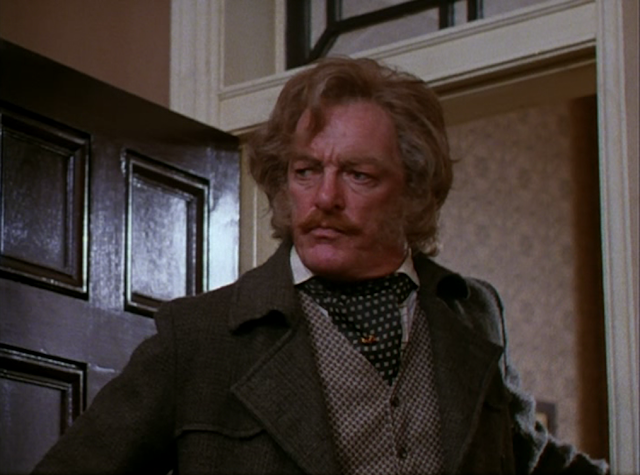 In the instance of Dr. Roylott, Holmes drove the snake back through the ventilator. It bit Roylott, we hear the scream, they race over to his room -- he's already dead! Now I have to imagine that Grimsby Roylott, who was a rather large man -- because "Our door had suddenly been dashed open and that a HUGE man framed himself in the aperture." That was his entrance to 221B Baker Street. I have to imagine that a man of that size it would take him longer to be affected by poisonous venom than his diminutive stepdaughter and yet he died almost instantly. What's the deal? Burt Wolder: [00:18:14] Well, you know, commentators over the years have inferred or suggested lots of things around that time difference one of which was: Well first of all (a), it's impossible. You would not have died that quickly from a snake bite, but (b) that Watson is a doctor and he would have provided some medical help, even for such a great villain is this. And so one could suggest that Watson is glossing over his medical dereliction of duty. Of course the other explanation is that it just makes for better reading. Scott Monty: [00:18:54] That's too simplistic. Now, do you think Watson may have helped them to his demise as part of that dereliction? Burt Wolder: [00:19:03] Well I don't like to think that they sat around smoking their pipes watching him expire. But it could be, you know, that it was [CROSSTALK]... what? Scott Monty: [00:19:14] He withheld brandy [LAUGHTER] -- the only medicine Watson knew that could have saved him -- he did not give him brandy. Burt Wolder: [00:19:26] Well it could be that it took longer to get into the room than we have from the published account, but that's really that's really very funny. "Watson! I believe-- I believe the spark of life is left. Do you have your brandy?" "Yes I do, Holmes." [HICCUP. Scott Monty: [00:19:38] "I've finished it." Burt Wolder: [00:19:43] "Let's have some first." [LAUGHTER] "It's a chill night, as you know Holmes. Your flask." [LAUGHTER] Brandy. Scott Monty: [00:19:55] I think absolutely -- as much as we're talking about Conan Doyle as the master storyteller, this is the kind of thing that adds to the drama, adds to the you know the excitement of the chase, and the climax and whatnot. It just -- it reads well. It would not have read as well and if they went in there and it took Grimesby Roylott 10 minutes to pass away. And you have one of these one of these melodramatic death scenes. You know, like Jon Lovitz as the master thespian: "You've KILLED Santa Claus!" Burt Wolder: [00:20:36] Well you know, you have got two lovely things here: the wonderful conclusion. And it should be noted that around 1910 Conan Doyle took the story after the success of the Gillette play Sherlock Holmes and brought it to the stage in another attempt to succeed with his own work with "The Speckled Band." But also the second thing is in the story, this really does give you more echoes of a subject that we've talked about before, which is Holmes and faith and Holmes remarks to Watson, "Violence does in truth recoil upon the violence and the schemer falls into the pit," which I think Baring-Gould observed this goes back to Ecclesiastes. "He that the diggeth the pit shall fall into it and whoso breaketh a hedge a serpent shall bite him. Jeremy Brett: [00:21:32] "Violence does in truth recoil upon the violent, and the schemer falls into the pit which he digs for another." Scott Monty: [00:21:40] And of course Holmes said that "the death of Grimesby Roylott would not weigh heavily on [his] conscience." Well, all of these and more are mere trifles. Clive Merrison: [00:21:55] That is of course a trifle, but there is nothing so important as trifles. 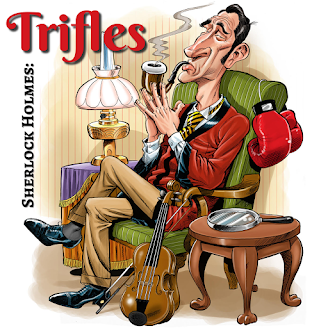 Narrator: [00:22:00] Please join us again next week for another installment of Trifles. Show notes are available on SherlockHolmesPodcast.com. Please Subscribe to us on iTunes and be sure to check out our longer show I Hear of Sherlock Everywhere, where we interview notable Sherlockians, share news, and go into even more depth on certain topics. Peter Barksworth: [00:22:22] "You take my breath away, Mr. Holmes." Jeremy Brett: [00:22:27] "This is a nice household."